Macrodactyly is a congenital disease where the digits affected increase in size faster than can be attributed to normal growth of unaffected digits. Its etiology is ambiguous and hereditary patterns do not play a role. The abnormality develops in one or more toes and involves thickening of soft tissues, bone and accumulation of fat. The accepted treatment is reduction of the fibro-fatty bulk via dissection and ablation; the major aim being reconstruction of a pain-free functioning foot. Complications with surgery include delayed wound healing and inadequate initial de-fatting which could require a more proximal amputation. Keywords: Macrodactyly, congenital deformity, thickened digit. Macrodactyly was first loosely coined by Feriz when he described lymphomatous degenerative lesions and called them “macrodystrophia lymphometosa progresiva.”  In the foot, the most common presentation of this pathology consists of excessive fibro-fatty tissue on the plantar aspect which causes dorsal curling of the toes. However, due to the rarity of this condition, there is scarce literature which discusses its incidence, prevalence and treatments. The purpose of this article is to discuss the etiology of macrodactyly and treatment options by the review of previous case reports. Figure 1 Macrodactyly affecting the second digit of a child. Since the treatment for macrodactyly is on a case by case basis, there will be a review of two different treatment options-one at an earlier stage in life and one at the adult stage. In a case study by Lagoutaris, early treatment of macrodactyly is discussed and could be viewed as a better option. Most patients that came in for treatment for macrodactyly were found to be in their late teens or adults;  although the condition is rare, an earlier treatment would benefit the patient in the future. A pediatric patient will not only benefit from an aesthetically pleasing foot, which will allow him or her to avoid any emotional distress, but will also be privileged to be fitted with normal footwear. Since the patient’s primary concern was to aesthetically preserve the toe, a nail graft was used in an osteotomy as well as debulking of subcutaneous tissue, instead of a simple amputation. Pho, et al., stated that although shortening of the toe via a simple amputation could have improved the overall morphology of the toe, without a nail, the toe would have looked abnormal. In this case, the need for a grafting procedure outweighed the simplicity of an amputation due to the patient’s needs and concerns for an aesthetically beautiful toe. Both cases were performed with minimal post-operative complications. Consequently, it is difficult to decipher whether treatment at an earlier age would be any more beneficial than treatment as an adult. While treatment at a younger age would save years of emotional distress and provide earlier comfort and relief of symptoms, a child may need to return for additional surgeries later in life. Furthermore, Uemura, et al.,  stated that it would be difficult to apply that type of procedure to progressive macrodactyly in children. If aesthetics is not of primary concern and if there are no related complications, then electing surgery at the adult stage when the patient is capable of making his or her own decision would seem ideal. Regardless, each case should be treated individually, based on the patient’s symptoms, needs and concerns. 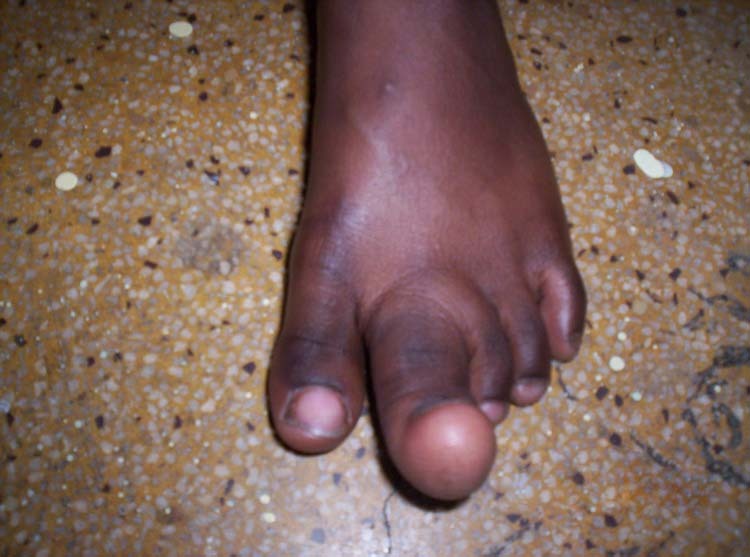 Macrodactyly is a congenital disease in which the soft tissue, bone, or fat of the digits affected is enlarged. Due to the rarity of the condition, the prevalence is unknown but predominantly associated with males more than females. Although there has been research conducted on macrodactyly, there is not much known about this deformity, including the etiology. Surgical options vary, and include but are not limited to debulking of the soft tissue and fat, partial osteotomies, and amputations. However, each deformity must be treated on a case by case basis. 1. Feriz H. Makrodystrophia lipomatosa progresia. Virchow Arch Pathol Anat Klin Med 1925 260: 308-368. 2. Kumar K, Kumar D, Gedegone W, Kapahtia N. Macrodactyly of the hand and foot. International Orthopedica 1985 9: 259-264. 3. 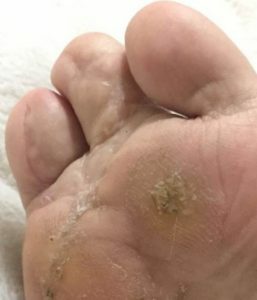 Cooke S, Davies H, Harris N. Chronic digital infection presenting with gross enlargement of the toes: two case reports and review of the literature. Cases Journal 2009 2: 102. 4. Barsky AJ. Macrodactyly. JBJS 1967 49A: 1255-1266. 5. Dennyson WG, Bear JN, Bhoola KD. Macrodactyly in the foot. JBJS 1977 59B: 355-359. 6. Syed A, Sherwani R, Quamar A, Haque F, Akhter K. Congenital macrodactyly: A clinical study. Acta Orthop Belg 2005 71: 399-404. 7. Kotwall PP, Farooque M. Macrodactyly. JBJS 1998; 80B: 651-653. 8. Streeter GL. Focal deficiencies in fetal tissues and their relations to intrauterine amputation. Contrib. Embryol. 1930 22: 1-44. 9. Yuksel A, Yagmur H, Kural BS. Prenatal diagnosis of isolated macrodactyly. Ultrasound Obstet Gynecol 2009 33: 360-362. 10. Ben-Bassat M, Casper J, Kaplan I, Laron Z. Congenital Macrodactyly. JBJS 48A: 359-364. 11. 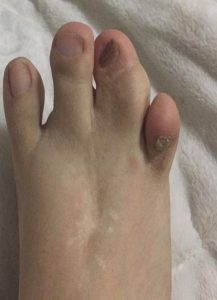 Uemura T, Kazuki K, Okada M, Egi T, Takaoka K. A case of toe macrodactyly treated by application of vascularized nail graft. Br J Plast Surg 2005 58: 1020-1024. 12. Tsuge K. Treatment of macrodactyly. Plast Reconstr Surg 1967 39: 590-599. 13. Lagoutaris E, DiDomenico L, Haber L. Early surgical repair of macrodactyly. JAPMA 2004 94: 499-501. 14. Hsieh C, Kumar J, Riddle E. Macrodactyly of the foot. JBJS 2002 84A: 1189-1194. 15. Fengdong Z, Rongrong Z, Peihua S, Shunwu F. Macrodactyly of the great toe for thirty-five years. J Plas Recon Aes Surg 2009 62: e520-e522. 16. Pho RW, Patterson M, Lee YS. Reconstruction and pathology in macrodactyly. J Hand Surg Am 1988 13:78-83. 1 Ellise Natividad 10104 Rodeo Drive, Waco, TX 76712. (254) 495-9891. 2 Kinna Patel 8654 Marlamoor Lane, West Palm Beach, FL 33412. (646) 279-8657.